Huadu District is a district of Guangzhou, the capital of Guangdong province, China. It is located in the far northern suburbs of the city. Xinhua Town is the seat of local government, and of the district CCP committee. The distric is mostly Hakka speaking, and is the ancestral home of many Overseas Chinese of Hakka descent. Hua County was the hometown of many Taiping Rebellion leaders like Hong Xiuquan and Hong Rengan. 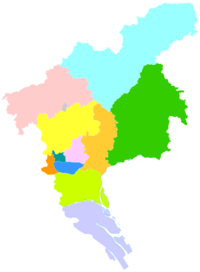 The district was established in the Qing Dynasty (1644–1911) as a county, Hua County or Huaxian (Chinese: 花县; pinyin: Huāxiàn; Cantonese Yale: Fāyún, also known as Fahsien), which was located north of the then city limits of Guangzhou. It remained a county until 1993, when it was recognized as a city and renamed as Huadu (Chinese: 花都; pinyin: Huādu; Cantonese Yale: Fādōu). In 2000, it became an attached northern suburban district of the expanded municipality of Guangzhou. Natives of Huadu speak a dialect of Yue Chinese called Huaxian (Chinese: 花县话; Cantonese Yale: Fāyún wá or Fahsien). In addition to its population, Huadu is the hometown of approximately 300,000 overseas Chinese, including some in Hong Kong and Macao. Guangzhou Baiyun International Airport, Guangzhou's main airport, is located in the district, as is Guangzhou North Railway Station on the Wuhan–Guangzhou High-Speed Railway. Huadu District is rich in natural resources. With a rich rainfall, Huadu is abundant in a variety of crops, vegetables, tea, litchis, bananas, longans, peanuts and sugarcane. Jingtang Lotus Roots are thought to originate here in Jingtang Town. The mines proved up are up to 18 varieties among which the largely-reserved and high-rank limestone, kaolin, clay and granite etc have a bright future of mining. The district also is rich in water. The annual flux of the surface water on average for years is 1.15 billion cubic meters. There are 17 reservoirs of medium and small size in the district. The Liuxi River and Bajiang River are across the district. There are currently 4 subdistricts and 6 towns. On 2 December 2013 three new subdistricts (Huacheng, Xiuquan, & Xinya) were established from carving out Xinhua Subdistrict, while upgrading Yayao Town into a subdistrict. ^ a b "A Survey of Huadu District". lifeofguangzhou.com. 2006. Huadu district has a 720,000 population. It is the hometown of many overseas Chinese, and it has approximate 300,000 overseas Chinese and Hong Kong and Macao compatriots. ^ Hwang, Jessie. "A Survey of Huadu District". Retrieved 25 January 2018. ^ "关于同意广州市调整花都区部分行政区划的批复". 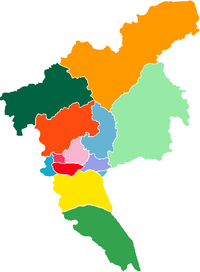 Guangdong Province Census Network. Guangdong Provincial Government. Retrieved 11 April 2018. Wikimedia Commons has media related to Huadu District.